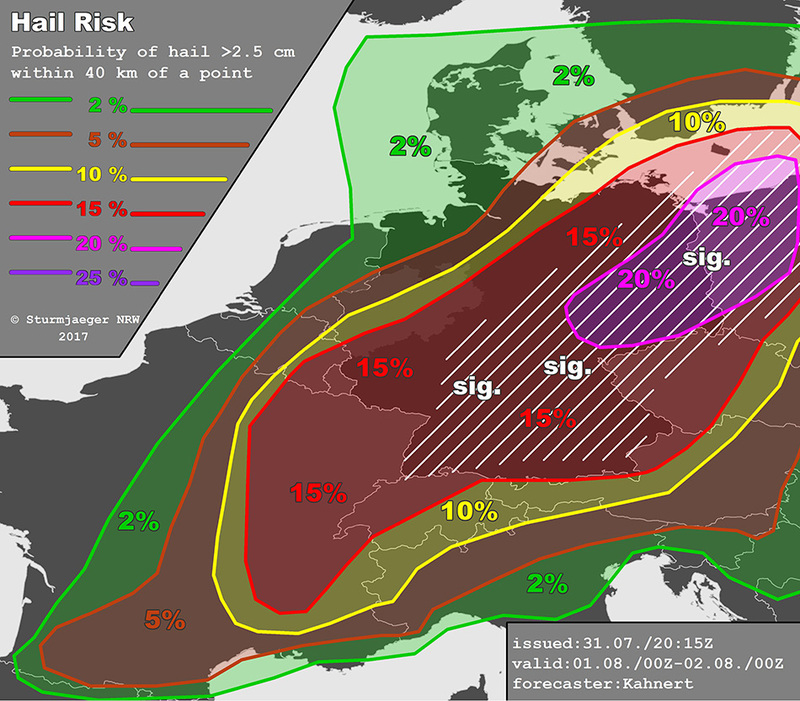 Wie bereits angekündigt, folgt nun unser Convective Outlook für morgen. Über weiten Teilen Deutschland besteht eine hohe bis sehr hohe Unwetterfahr durch heftige Gewitter mit großem bis sehr großem Hagel, Orkanböen, Starkregen und Tornados. Für den Nordosten Deutschlands, wo die Chance für Unwetter wahrscheinlich maximal ist, besteht daher ein Severe Threat 3. Auch in NRW besteht bereits in der kommenden Nacht, aber vor allem morgen ein hohes Gewitterrisiko, wobei die Unwetterbereitschaft von Nord nach Süd zunimmt. Ganz so heftig wie im Nordosten wird es aber wohl nicht. 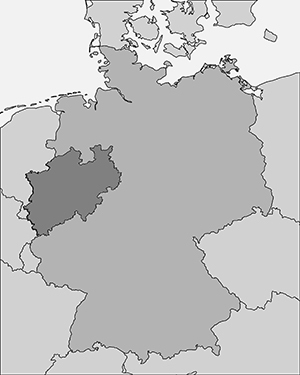 Der äußerste Norden und Nordwesten von NRW könnte sogar gänzlich außen vor bleiben. Wir beobachten die Lage rund um die Uhr und werden euch Bericht erstatten und ggf. den Outlook updaten bzw. upgraden. 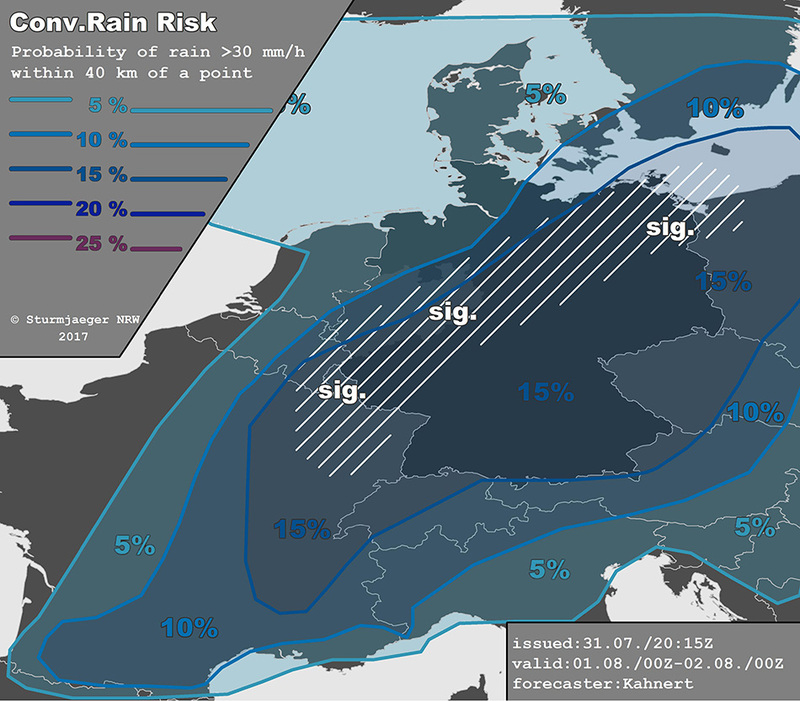 Vor allem falls ihr im Severe Threat 3 wohnt (aber auch sonst), verfolgt aufmerksam den Himmel und die Warnungen des Deutschen Wetterdienstes. An extensive upper trough is anchored over the N Atlantic with its main axis running from the British Isles to the W Iberian coastline. Ahead of it, intense WAA regime spreads across central Europe yielding deep baroclinicity and an intensifying anticyclonic curved jet streak. At lower levels, a wavy airmass boundary stretches from S France over Germany to N Poland, marking the interface between a polar-maritime airmass North of it and a highly unstable subtropical airmass to the south. As it slowly expands northwards, warm-frontogenesis takes place across Germany mainly in the evening and night to Tuesday. Tomorrow, the aforementioned trough loses amplitude and experiences eastward propagation as a new deep Atlantic cyclone advances from the West. As a consequence, the trough-ridge pattern as well as the sfc boundary gets more progressive. Due to substantial overlap of high potential instability and unseasonably strong kinematics, a particular dangerous situation will be unfolding on Tuesday afternoon/evening across CRTL Europe. Today, isolated DMC along the northwards moving warm front mainly influenced parts of E France and S Germany. Severe risk with these storms was marginal due to missing BL rooting and high inflow layers, respectively. Currently, the warm front is digging northwards and DMC has already developed along the accompanying surface boundary. Although most cells may be elevated, total severe potential will gradually increase, as the overlying jet intensifies (due to jetogenesis). As also sfc and ML frontogenesis is present in those regions, a top-of-BL LLJ may develop over night, working as a moisture conveyor belt. Well organized convection such as supercells or a MCS appear most probable in a curved line from Lorraine over SW to E/NE Germany during the early morning hours. As the storm propagation is forecast to be parallel to the boundary, severe or even significant severe convective precipitation will be the primary hazard, followed by severe wind gusts (at the leading edge of the MCS) and large hail up to 5 cm. – All models (even conservative ECMWF-IFS) agree in the fact, that moderate to high and well capped instability between 1500 and 3000 J/kg ML CAPE is superimposed by a highly kinematic environment with 0-6 km DLS of 20-35 m/s (even higher values are locally possible). Any discrete cell that initiates in such an environment will instantaneously achieve a mesocyclone and be capable of producing very large hail in excess of 5 cm in the early stage! Steep mid level lapse rates up to 8 K and CDI values of maximum 100 J/kg/km indicate a chance for locally giant hail of nearly 10 cm in diameter mainly in the Severe Threat 3 and the sern part of the Severe Threat 2. As strong cold pools manage to form, the primary supercell type will be the HP type. Cold pool interaction with 0-3km bulk-shear between 15 and 25 m/s and a boundary-orthogonal storm motion vector will result in a forward building MCS/squall line with bowing segments. Even a (wide spread )damaging wind event cannot be ruled out given the increasing QG lift in the evening. Generally it has to be underscored, that the chance for linear clustering/bow echo development is maximized in the northern Severe Threat 2 / Severe Threat 3, whereas the cell mode in the srn Severe Threat 2 tends to be more discrete (supercells). As a Severe Threat 3 requires widespread severe/significant severe DMC, we go with a high-end Severe Threat 2 for srn Germany. An upgrade may be necessary tomorrow. If CI actually takes place between 15 and 18 UTC, supercells have enough time to generate low level rotation before BL-stabilization sets it. We introduced a 5 % tornado line including the chance for a significant tornado event (> F2), where 0-1 shear is maximized while LCL is low. 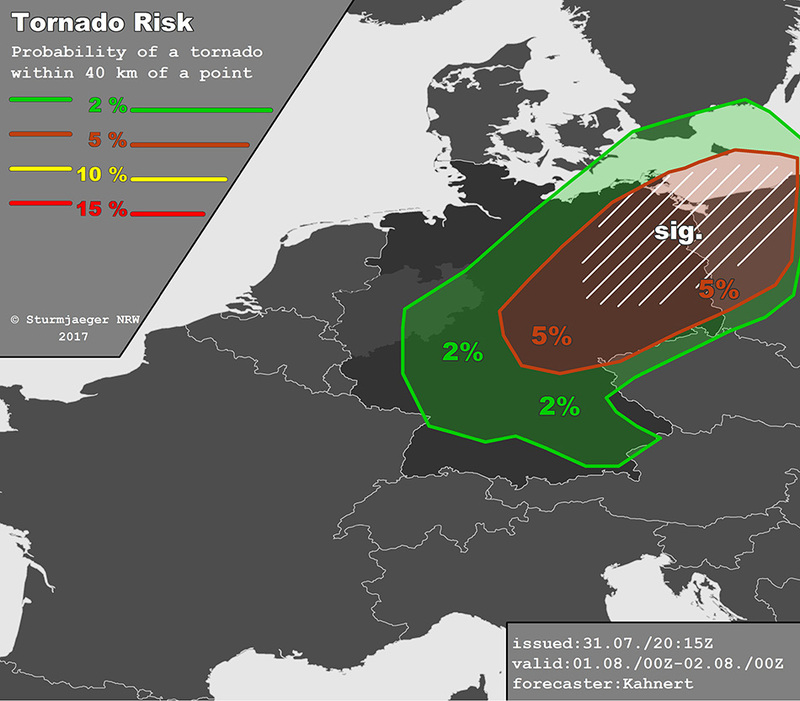 Convection will stay severe to significant severe concerning all hazards while shifting to Poland and the Czech Republic in the evening/night.